This is a list of the full color palettes for notable video game console hardware. For each unique palette, an image color test chart and sample image (Truecolor original follows) rendered with that palette (without dithering) are given. 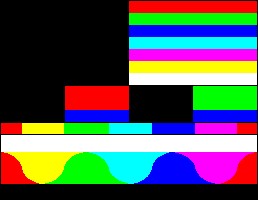 The test chart shows the full 8-bits, 256 levels of the red, green and blue (RGB) primary colors and cyan, magenta and yellow complementary colors, along with a full 8-bits, 256 levels grayscale. 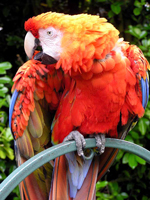 Gradients of RGB intermediate colors (orange, lime green, sea green, sky blue, violet and fuchsia), and a full hue's spectrum are also present. Color charts are not gamma corrected. 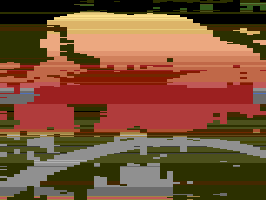 The Atari 2600 used different YIQ color palettes dependent on the television signal format used. The Picture Processing Unit (PPU) was used in the Nintendo Entertainment System and used the YIQ color space to create a 64-color palette, of which nine are duplicates and one is out of NTSC's gamut, giving a total of 54 useful colors. The palette is built based on four luminance values and twelve combinations of Pb and Pr chroma signals (plus two series of Pb = Pr = 0 for eight pure grays). Two of the shades of gray are identical, one has negative brightness, and one is within 2% of another, so sometimes the palette has been reported to have 53 to 55 colors. In addition to this, it had 3 color emphasis bits which can be used to tint the entire palette any combination of red, green and blue. This extends the total available colors to 432, but inconveniently divided into 8 variations of the base 54. Because it affects the whole palette at once it may be considered more of a filter effect applied to the image, rather than an increased palette range. 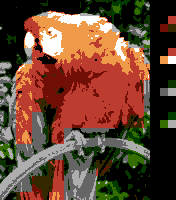 The NES could select 4 palettes each containing four of these colors (however, color 0 of each palette has to be the same, so technically, 13 different colors are available at a time) to be applied to the background. 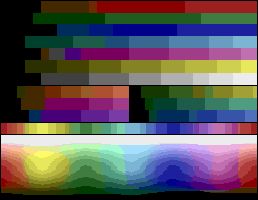 A background palette is applied to a 16x16 pixel area, however through a special video mode of the MMC5 mapper it is possible for every 8x8 pixel tile to have its individual palette. As for sprites, 4 different palettes can be used at a time (with color 0 being transparent in each) and every 8x8 or 8x16 pixels can have their own palette, allowing for a total of 12 different colors to use for sprites at any given time. The original Game Boy uses a monochrome 4-shades palette. Due to the fact that the non-backlighted LCD display background is greenish, this results in a greenscale graphic display, as it is shown in the simulated image (at Game Boy display resolution), below. The Game Boy Pocket uses a monochrome 4-shades palette using actual gray. The Game Boy Color systems use a 15-bit RGB (32,768 colors) palette. The specific Game Boy Color (Type 3) game cartridges presents up to 56 colors without the use of special programming techniques from the full 32,768. From these, 32 are for a background palette, plus 8 hardware sprite palettes, with 3 colors plus transparent each. Typically, the sprite palettes shares some colors (black, white or others), so the total colors displayed are less than 56. 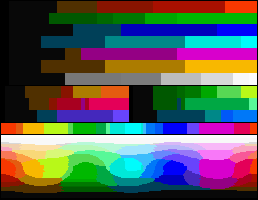 Though there is a 56 color limit, this in of itself is a palette storage limit and not an actual hardware limitation. As such, the programmer can swap out the palettes on a per-scanline basis. Because of this ability to swap out the palettes each scanline, over ten thousand colors can actually appear on screen per frame when programmed on a per-scanline basis. When an older monochrome original Game Boy game cartridge (Type 1) is plugged-in, if certain combinations of the controls are held during startup (or if the game is recognized from a hard-coded list in the device's ROM), the games are colorized with one of the factory 12 false color palettes. In this mode, games can have from 4 to 10 colors, due 4 are for the background plane palette and there are two more hardware sprite planes palettes, with 3 colors plus transparent each. 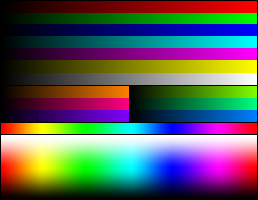 The Game Boy Advance/SP/Micro systems also uses a 15-bit RGB palette, and along with the original and Color modes, they have also a specific Highcolor 32,768 colors mode. The LCD displays of the Micro and some models of the SP are backlit, giving brighter images. The Master System had a 6-bit RGB palette (64 colors), with 31 colors on-screen at once. It is possible to display all 64 colors at once using raster effects (line interrupts). There are only 512 different 8x8 tile patterns to cover the screen though, when 768 would be required for a complete 256x192 screen. This means that at least 1/3 of the tiles will have to be repeated. To help maximize tile reuse, they can be flipped either vertically or horizontally. The 64 sprites of 8x16 pixels can also be used to help to cover the screen (max 8 per scanline). Because of the constraints mentioned above, there are no current correct simulated screen images available for the Sega Master System. 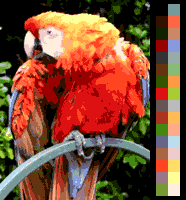 The Game Gear had a 12-bit RGB palette (4096 colors), with 32 colors on-screen at once. The Mega Drive/Genesis used a 9-bit RGB palette (512 colors, 1536 including shadow and highlight mode) with up to 61 colors on-screen at once without raster effects (4 palette lines of 16 colors each, palette indices $x0 are definable but considered as transparent, and can only be used as the background color). The TurboGrafx-16 used a 9-bit RGB palette, like the Mega Drive/Genesis, consisting of 512 colors with 482 colors on-screen at once (16 background palettes of 16 colors each, with at least 1 common color among all background palettes, and 16 sprite palettes of 15 colors each, plus transparent which was visible as the overscan area).